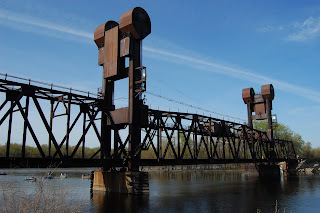 This is BNSF's rail bridge across the Saint Croix River, just before it empties into the Mississippi. It's a solidly built lift bridge, built in 1984. It connects Minnesota to Wisconsin. This is the view from the upstream side in Wisconsin, in the town of Prescott.